Do you have a hard time pronouncing certain sounds in English? Do you believe that it’s nearly impossible to improve your accent? 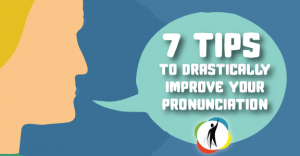 I´m here to tell you that you can drastically improve your pronunciation in a short amount of time. It´s going to take an open mind, consistent effort, and experimentation with new strategies, but it’s not as hard as you may believe. With pronunciation, a little effort goes a long way. You just have to want it bad enough and be consistent on the fundamentals. There are a lot of very helpful, well-done youtube channels that focus on pronunciation. Beyond our very own Youtube Channel, RealLife TV, which teaches pronunciation in dynamic ways, Rachel’s English is a series of free pronunciation videos that teach phonetics and English pronunciation. Other recommended youtube pronunciation channels are listed below. American English Pronunciation (Seattle Learning Academy) has over 150 free downloadable podcast episodes teaching American English pronunciation. If you had to hum the language, what would it sound like? Making this awareness a part of your learning process is important. Check out this youtube video of an Italian group singing in words that don’t exist. The funny part is that it totally sounds like English but they are speaking unintelligible gibberish. If you weren’t paying attention, you wouldn’t notice the difference. The application is more of an attitude rather than a strategy, as it involves constant awareness rather than routine, but it’s definitely something to keep in mind. We also Recommend How Music Can Make You Fluent, Intonation: The Secret Ingredient to Great Pronunciation (with Audio), and Is Bad Pronunciation Killing Your Fluency? If your pronunciation level has not been stabilized, I don’t recommend reading for more than 10 or 15 minutes, because people tend to lose their concentration, and go back to their vices (which is to reinforce them). Remember, pronunciation can be improved quite quickly with small, concentrated doses even only a few times per week. Here’s a helpful article on reading out loud. One way around this, however, is to listen to the audio book while you read the text and imitate the speaker. For greater effectiveness, record yourself speaking and compare it to the audio book. As mentioned above, recording of a native speaker reading the same passage (such as an audiobook, podcast, or a native speaker friend) could facilitate your process. Here are a few recommended web sites that focus on pronunciation. Ship or Sheep is a good place to experiment with recording yourself. I’m going to break this one up into two categories: (a) language learning role models, and (b) role models to imitate. Both of them can help you become a better speaker, but in different ways. LANGUAGE LEARNING ROLE MODELS are people in your life who speak well and have worked hard to get there. Maybe it’s a teacher or a friend, but they are someone who has learned through hard work and can explain the process to you. ROLE MODELS TO IMITATE are people with accents that you want to imitate. Native speakers and people who are naturally talented usually don’t understand the processes that guide their pronunciation (although a few do), but they are good role models to imitate. As you watch TV and movies, choose somebody who has your type of voice, communication style, and who you would like to emulate. If you don’t know, ask your friends to recommend somebody. You could even memorize parts of movies you like, imitating the actors. The act of imitating somebody speak is called SHADOWING. Check out this helpful video below on the topic. This is another idea that deserves its own post, but I’m going to post the article and summarize it here. I’ve met several seemingly gifted language learners who swear this is how they learn languages. Here’s a basic summary from the study/ article by Laurence M. Hilton. The idea, in a nutshell, is to imitate a native speaker of the language that you are learning, speaking your language, and apply it back to the target language. Let me give you two valid examples. In my case, I am American, so I need to find an example of a Brazilian speaking English with a really exaggerated accent, learn to imitate it, and apply it back to Portuguese. Does this work? My intuition tells me that it does. It really fits into what I’ve learned from the “master” language learners. IN CONCLUSION, while the title includes “English Pronunciation,” most of these tips and strategies can be applied to any language. Interestingly, as a native English speaker, I would like to point out that my own best insights and teaching do not come from a superior understanding of the English language, but from my own personal learning processes of Spanish and Portuguese. Finally, I would like to clarify that my own pronunciation in Portuguese is far from perfect, but in all the years of teaching and learning languages, and observing the best language learners, the answers have been put in front of me. Subscribe to our mailing list to get a really awesome and FREE mini-course on how to make English a part of your life, and you’ll also receive our newsletter with exclusive language learning tips, updates as to events, and access to our vast database of articles. Finally, we would really appreciate it if you spread the word about the project and tell your friends about it. Thanks a lot! This is a continuation of our pronunciation series, and “How to Reduce Your Accent in English,” which addresses some of the attitudes that impede people from improving their pronunciation. Another extremely helpful article that we wrote is “Top 5 Mispronunciations Made By Brazilians”(which covers the sounds: ED, TH, EE at the end of words, CH/SH/T and H vs R). Great tips Justin If anyone in the Real Life group is interested I will be teaching an intensive 2 week pronunciation course in Conceiçao do mato dentro in July. I have already taught this course in Rome, Italy and it was very successsful. These are excellent tips Justin. You explained them well. I urge my students and clients to use strategies 1-3, 5 &6 on a weekly basis. Those who live outside North American especially need to listen to North American radio shows and podcasts. My clients usually prefer NPR to VOA (VOA is a bit slow). I’ll take a closer look at the idea of reverse mimicry. That looks complicated…. Thanks Susan, I took a look at your blog and it seems like you know what you´re doing. If you want to share your videos and any articles you might have in the Real Life English community, check it out http://www.facebook.com/groups/reallifeenglish/ Take care! Tunein Radio is great too! I love your reverse accent mimicry idea, and yes, it does sound like it should work! Hey Vicki, Thanks for your comment! Are you learning any other languages? I’d love to hear what you learn about the reverse accent mimicry. I checked out your youtube channel. Pretty cool. We have an international community http://www.facebook.com/groups/reallifeenglish/. You’re welcome to share your content there. Take care! Hi Denise, the Portuguese was just an example because we have a lot of Brazilians in our community. You should imitate a native English speaker speaking your native language (filipino?). This is a great resource for learners. I find the reverse accent mimicry particularly interesting. Great, this article it's so amazing. Hey Jagruti, Check this post out- http://reallifebh.com/pronunciation-fluency It takes what this article was about and goes A LOT deeper! Thanks for reading and commenting. I have been learning English since I was a kid, I am currently living in an English speaking country… but I was a bit (more than that actually) frustated that I could read, and understand a lot although it often wasn’t the other way round… sometimes when I say the simplest sentence, isn’t understood. I am utterly happy that I have found this page. The advice given here is mind blowing!!! Maybe I have taken a wrong or not so efficient path… how is it possible that I can spell mostly every single word I don’t know how to pronounce?? While reading this article it has come to my mind one funny misunderstanding just because of that…. RHYME and RHYTHM!! I wanted to talk about an old friend repairing is car… at one point I saw some puzzled faces. They asked me: why would he put and old in jeans in his car? I was trying to explain that he put and old engine. Sound…Rhyme and rhythm… quite inspiring. Thanks a lot for the whole site! Thank you guys for your opinions.I just want to share some information about my experience with http://www.bellsenglishonline.com/. I took a "Free" course on their website "try for free'',which gave me quite a lot of materials.Than after a while I was wondering about purchasing a course,since if You want to study with whole process it's necessary.I'm very satisfied about my progress with this course-I can recomment to anyone who want to improve their english. Hey Maria, Thanks a lot for the comment. I’m really glad we can be of service in some way. Where do you live? Remember on the other side of things that you are bilingual and that’s a huge asset! Buena informacion. No se pierde nada con tratar. above mention tips are really so fruitful for those who is wondering for such ideas and things to bring a drastically changes in their general pronunciation in short. Hi! How to go on communication on Twitter with native speakers? Thank you. The advices are excellent! Congrats for such nice work! The article is invaluable to me, I have been in Canada for almost 2 years, enunciation is one of the things I have to work on. I got called out a couple of times for my bad enunciation. I loved this article. When we are studying a new language, it’s always necesary improve our language skills and when we find a topic to talk about or a way in order to learn it…it’s GOOOOOOOOOOOOD. I love the shadowing way. I love watching movies and reading book and when we see a good script, the lines keep in our minds. Best of luck and let us know if there’s anything else we can do!